The birds and the bees love the springtime, and so do brides and grooms! If you’re saying “I do” this spring or one soon to come, spoil your guests with some of these unique, DIY wedding party favors. They run the gamut from rustic and cute to refined and classy. Save money on your wedding souvenirs by making the following two yourself! Modern times have removed many of us from growing our own food and making supplies. Get back to your roots by creating one of the easiest and cheapest substances around, soap! DIY lavender soap may feel lavish, but it’s pretty simple. Follow this recipe to make your own, natural lavender soap for your wedding. 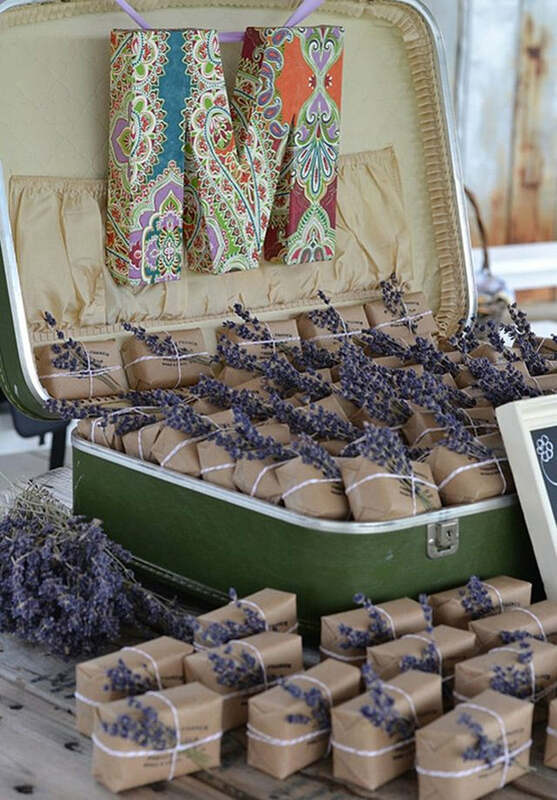 We love how this person above wrapped their soap in brown paper and twine with a garnish of dried lavender. You can do the same. Or if you choose another scented soap to make for your big day, use that as inspiration (i.e. fresh mint for mint and oatmeal soap, honeysuckle sprig for honeysuckle soap…). The morning after a long night of partying at your wedding will leave guests weary (and probably hung over). 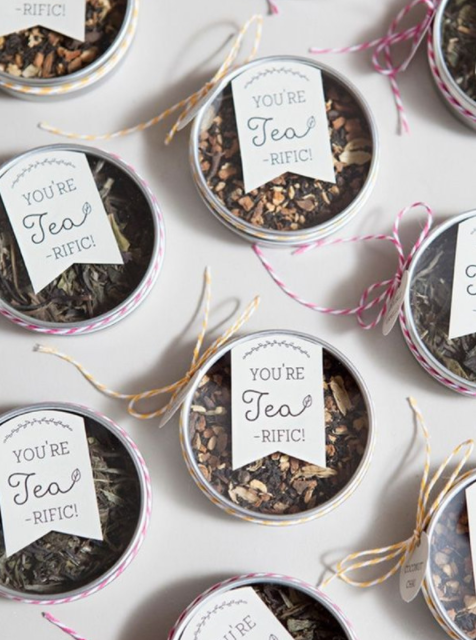 Give them a wedding favor that will serve them well the next day: coffee or tea! Get the look done by this crafter by ordering loose leaf tea in bulk from a gourmet company like Harney and Sons. Then, purchase cosmetic cases with clear tops and stuff your tea inside. Tie with twine for a rustic appeal or soft ribbon for a more feminine touch. Tea can easily be changed out with coffee beans, or you can do both and let your guests choose what they want to take home to remember your special day! Don’t want your wedding to be another run-of-the-mill affair? Not keen on giving out monogrammed coasters to all your guests and finding them at Goodwill the next month? Try some of these unique wedding favor options to please every party-goer. 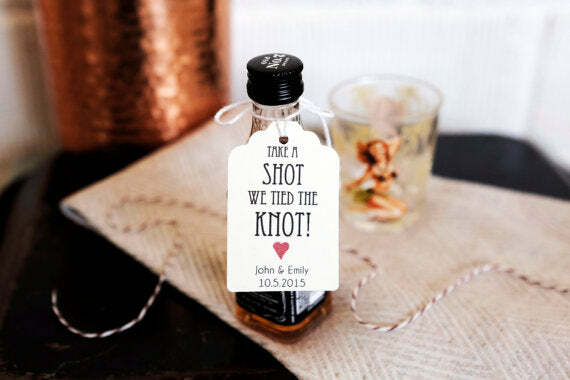 It still could be cold come springtime, so help your guests warm up and break the ice with these boozy wedding favors. Talk to your significant other and come up with a his and hers option (like Jack Daniels and Tanqueray). Then, make or order custom labels like this person did below that represent your love. Trying to figure out a classy way to display these wedding favors? How about pairing your his and hers airplane bottles with mixers and placing them at each table? So if you have a cute whiskey bottle like this one here, bundle it up with a mini can of coke or ginger ale. That way, guests can get some immediate gratification and get the party started. Macarons are so delightful, dainty, and delicious. Depending on your wedding theme, choose macaron colors that echo the look. 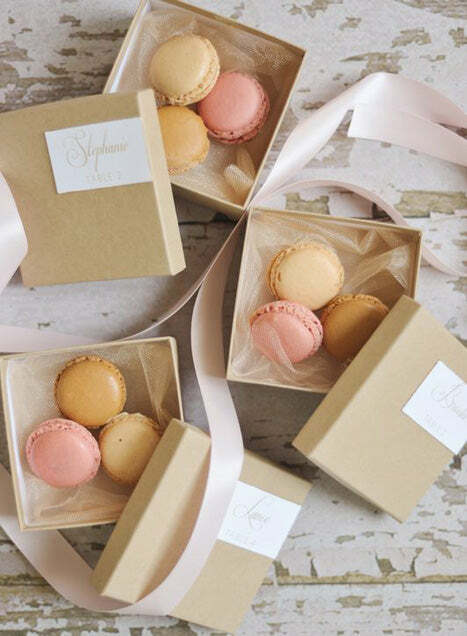 Finish your party favors for all of your wedding guests by wrapping one or a few macarons up in clear or cardboard boxes. Represent the vitality of your relationship with a living, breathing wedding favor! The following are all live options to add freshness, greenery, and natural beauty to your wedding. Seeds are about as cheap a wedding favor as you can buy! Buy in bulk and you’ll spend less than $1 per guest. Then, make a very bland item really exciting in the presentation. Spring and gardening go hand-in-hand, so we love how this couple displayed their seeds in a wheel barrel. 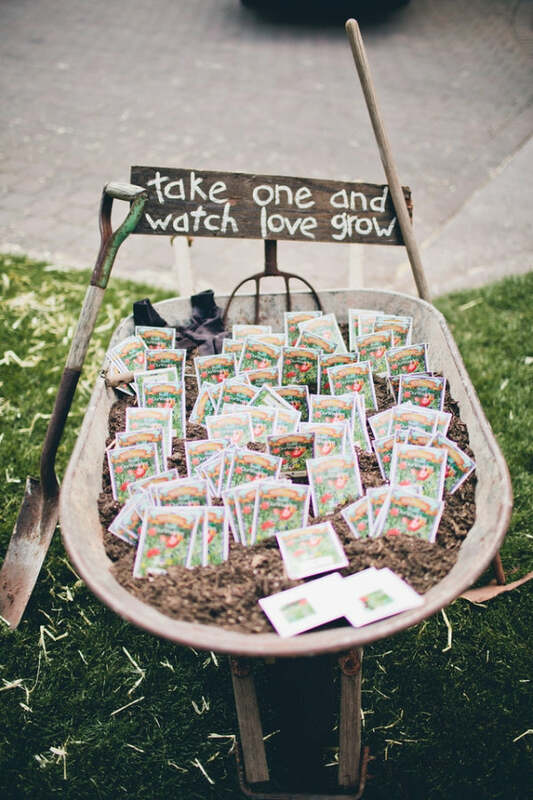 If you don’t want a pile of dirt at your wedding, you can set seed packets out in a pretty basket, put one at each place setting with a card or cute label, or place the packets inside tiny terra cotta pots. Go with the theme of your wedding to make this affordable and useful wedding gift a success. Herbs are cheap, fragrant, and pretty. Plus, they add a nice dose of greenery to your special day. Choose baby herbs like thyme, rosemary, and mint and pot them for every guest. You can do this a week ahead of your wedding, but don’t forget to water your plants! 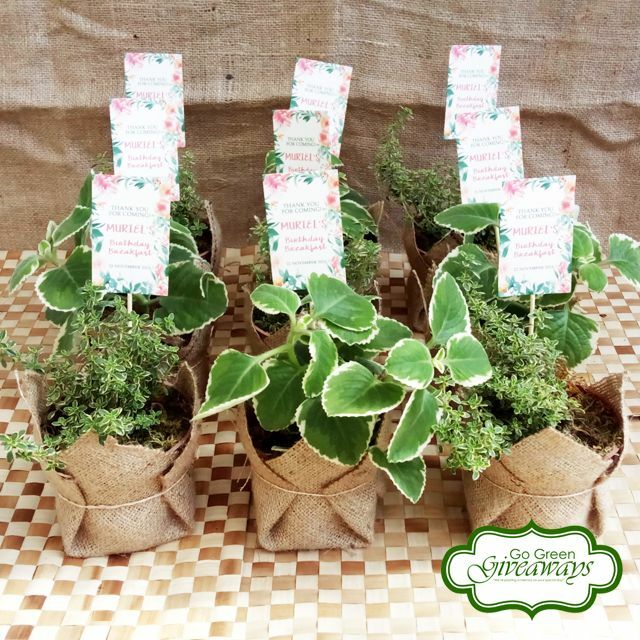 If you don’t want to have to worry about breakable pots, try Chinese takeout containers for your herbs or wrapping them in burlap. If you choose something biodegradable then your guests will be able to pop the whole thing in the ground once they get home and enjoy flavorful herbs for years to come. 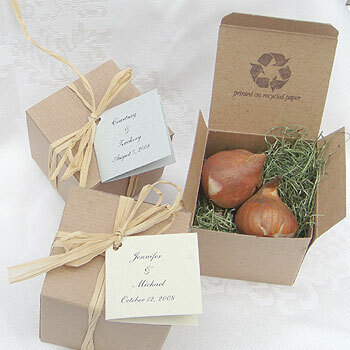 Springtime weddings are the perfect time to give flower bulbs as wedding favors. Why? Because your guests can take them home and plant the bulbs that fall. The following spring, when the bulbs come up they’ll be reminded of your nuptials and everlasting love. Bulbs need to be kept in cool, dry, and dark places, so don’t leave these wedding favors out on a hot and sunny day! Have your wedding coordinator place these bulbs in a shaded, cool area so your guests get blooms, not duds. 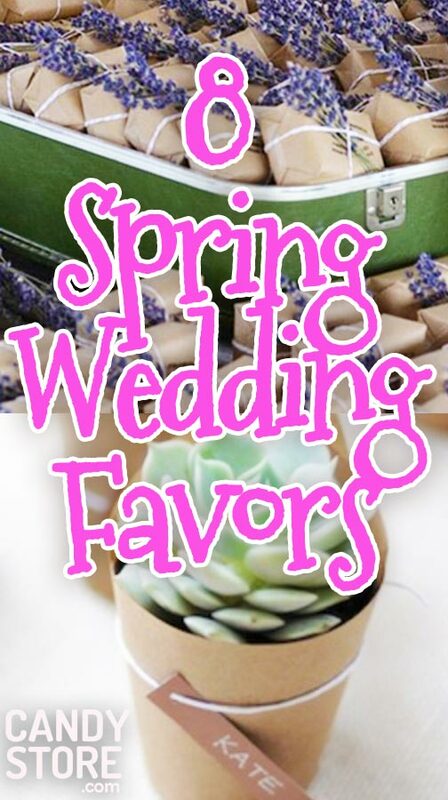 The best option for no-muss-no-fuss brides and grooms is most certainly a succulent. These wedding favors don’t need much at all. In fact, they only need about 1/4 cup of water every 2-4 weeks. 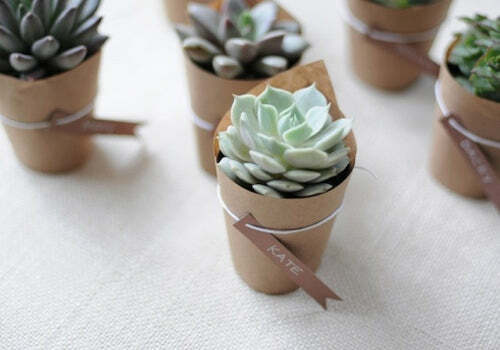 The best thing about these wedding favor succulents is the fact that they’ll stand up to heat on a wedding day and travel back to your guests’ homes. As long as they don’t get bumped around too much, they’ll be gorgeous additions to your wedding and great gifts too. Congratulations on your upcoming spring wedding! It’s truly one of the loveliest times of year to tie the knot. If you’re looking for any more ideas for your wedding, check out our custom candy buffet tutorial. It’ll show you how to create a display that puts the pros to shame.